Former President Daniel arap Moi ordered the transfer of $76m to a company at the heart of Kenya's biggest financial scandal, a top aide alleges. Philip Mbithi, the president's former head of cabinet, said he was asked by Mr Moi in September 1992 to organise a transfer to the Goldenberg company. A commission is investigating fake subsidy payments for exports of gold and diamonds which did not exist. Mr Mbithi is the most senior official to appear before the commission. 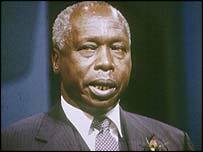 Mr Moi's lawyers have denied that he ordered any illegal payments during his presidency. Since the government launched anti-corruption investigations, Mr Moi, members of his family and his aides have been cited in a number of inquiries, investigations and court cases. Euro Bank: Went bust early 2003 after it was found that almost $14m of public money had vanished from its accounts. Police ordered to question Moi, although he is not accused of wrongdoing. Son Gideon being investigated over same case. Mr Moi - who left office a year ago after a landslide victory for the opposition led by Mwai Kibaki - has insisted he is not guilty of any corruption. In June he promised to co-operate fully with investigators and said he was not seeking an amnesty or pardon from the government.